4Runner is a big ute, rolling on a 109.8-inch wheelbase it’s a sizeable 191.3 inches long and weighs a hefty 4,750 lbs. 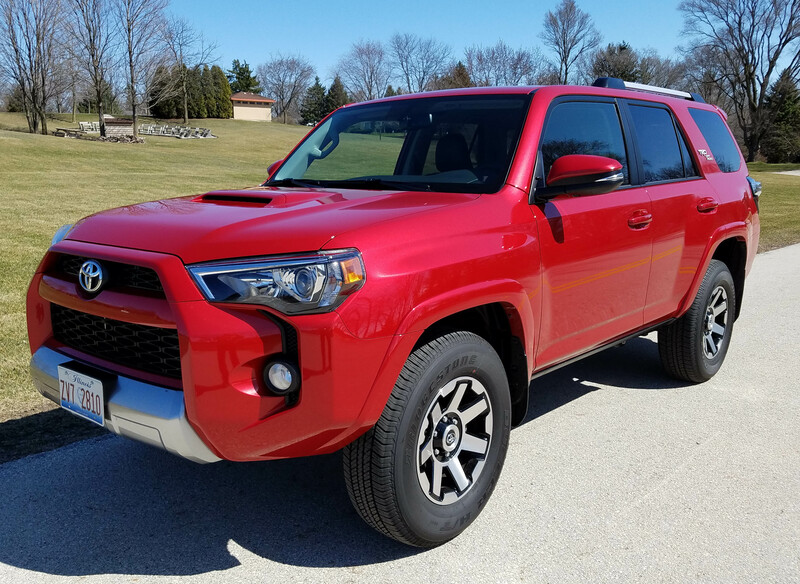 So move over mid-size crossovers and SUV pretenders, 4Runner is ready to go rock-climbing, and the TRD version thumbs its nose at rough terrain. That’s because the TRD packs on Bilstein shocks to absorb off-road rambles, plus extra skid-platting and it’s shoed with NittoTerra Grapler tires. Inside the seat fabrics are water resistant in case your splash around in the muck manages to seep inside. Toyota also loads this with more shift levers and terrain-control knobs and buttons than most airline pilots have to face before takeoff. Overhead are two dials for low to high off-roading settings and multi-terrain selections from mud and slush to rocks. There’s a crawl feature too and a shifter on the console, just behind and to the right of the main gear selector, for locking in the 4-wheel drive. You’ll need to study the manual a bit to make sure you have all the knobs and shifters in the right position for maximum grip and grunt in your favorite off-road run. Ground clearance is a hefty 9.6 inches and there are no running boards to get buried in mud. The downside there is crawling aboard requires long legs and/or a big step up that becomes a major effort for old short folks. Power is solid to say the least. Toyota uses its 4.0-liter V6 with variable valve timing. This is a proven power plant that pumps out 270 horsepower and 278 lb.-ft. of torque. You’ll never feel quick in this big, heavy beast, but you’ll feel you can haul or pull a good-sized load. Towing capacity is 5,000 lbs. Some will argue the 4Runner could use a 6-speed automatic transmission, but this 5-speed works well and seems well synched to the V6. However gas mileage is pathetic, and that’s where a 6-speed along with a stop-start feature could help. I got just 18 mpg in an even mix of city and highway driving, while the EPA rates this at 17 mpg city and 20 highway. Ride is decent for a big truck. While the shocks and heavy-duty suspension are aimed at off-roading, they are fairly compliant on normal roads. 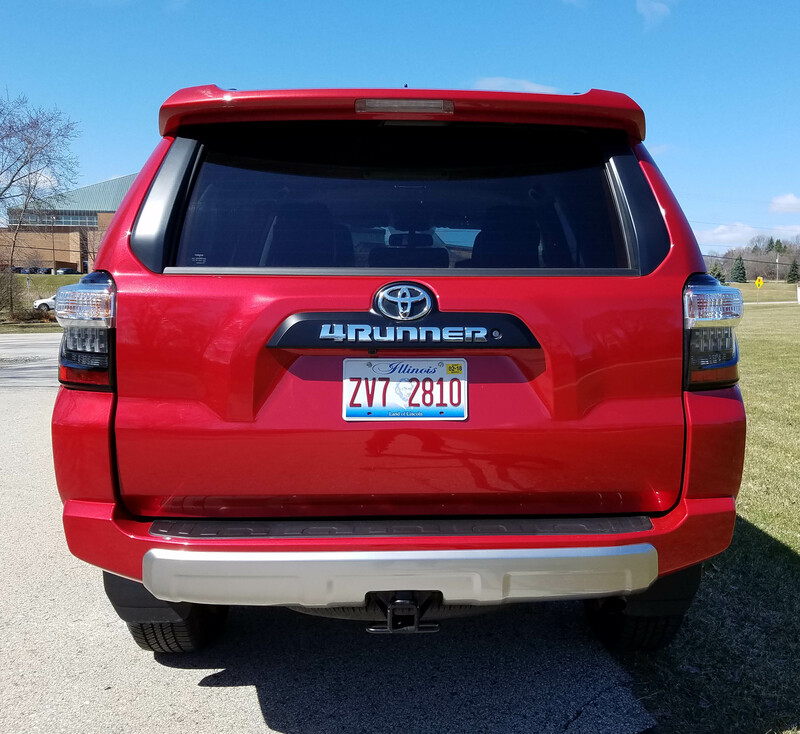 4Runner rides like a truck, and it is a body-on-frame vehicle, but bumps are mainly small annoyances. Where the truck’s stiffness comes into play most frequently is over short parking lot entry ramps where there’s a bit of rock and roll. Handling is all big truck with a fair amount of play in the steering wheel. That improves when you put the truck into 4-wheel drive. But overall the truck handles curves well with barely any lean. Braking is fine. I found no pedal fade in heavy use. The interior is roomy too with plenty of space for five adults. You also can get a third-row seat on the low-end SR5 and upscale Limited models. 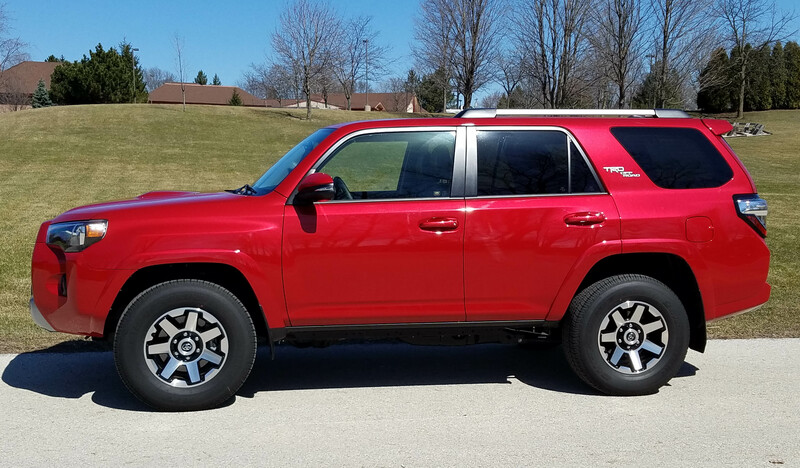 The TRD intends to be off-road and less a people hauler. So in back is a massive cargo area that grows to 89.7 cubic feet when the 40/20/40-split rear seat is lowered, and its folds completely flat. The test ute added a sliding rear cargo deck ($350) that can be pulled out when loading big items and makes retrieving the items at the cargo area’s rear much easier to access. 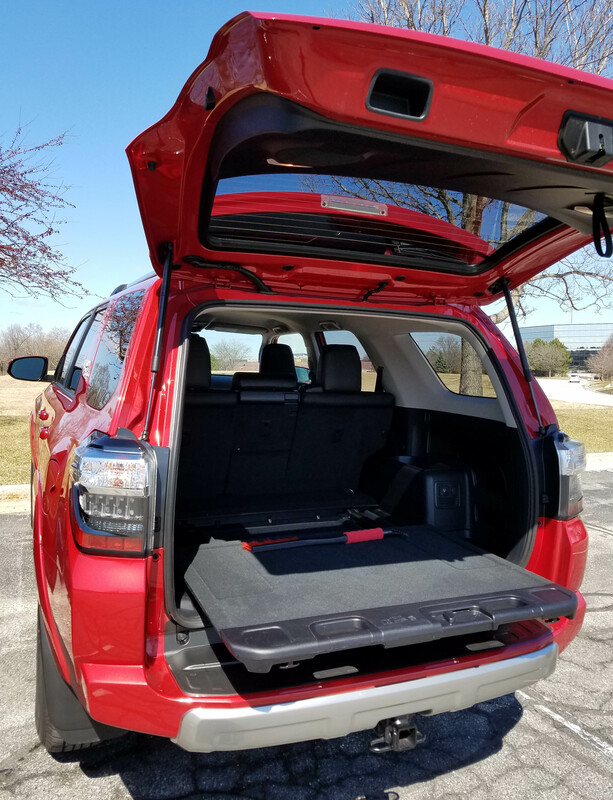 Check out this cargo tray you can pull from the back for easier cargo loading and retrieval. Controls and gauges are easy to see and use. 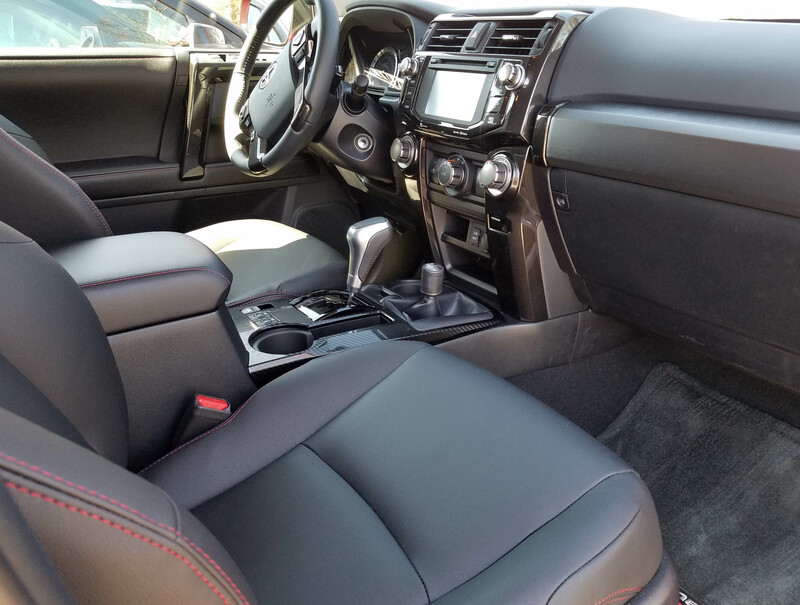 The test truck came with a black leather interior with red accent stitching on the seats and other trim. The dash top is black with a textured finish while a black gloss finish graces the steering wheel hub’s edges, door pull areas and center stack. There’s a matte gray wood-look trim on the passenger’s side dash. A carbon fiber look trim is used on the console. Toyota provides big control knobs, but a tiny nav/radio screen. Yet the radio buttons on the screen do work even if you’re wearing gloves while punching buttons. The manual tilt/telescope steering wheel also features the usual radio, trip computer and phone functions on the hub. Cruise control is on a stalk and is not dynamic. In fact, there’s precious little enhanced or autonomous safety systems here, no lane departure, blind-spot warning systems or automatic braking. There are, however, heated seats up front with variable temperature settings, and a button to lower the rear hatch’s big rear window, a boon when loading. The rear hatch isn’t powered though, and the hatch is quite heavy to pull down. Also, the steering wheel is not heated. Some would consider the key-start system a drawback, and as sad as it is to say, I kept forgetting to keep my key out each time I climbed aboard. If you are used to a key it’s no problem. 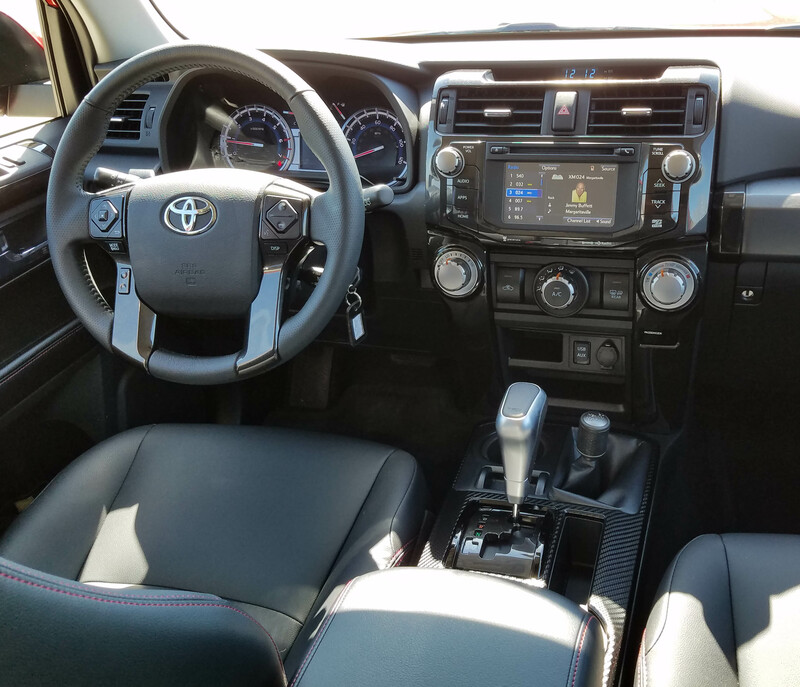 There’s also no sunroof in the TRD, a bit surprising at nearly $40 grand. I also noticed that on rainy days the water drains straight down the side of the roof onto the driver’s seat, and suspect the same for the passenger side. Still, the seats, when dry, were comfortable with good lower back support and mild hip support. Seats are powered and there’s a power lumbar support. Red stitching gives the seats some style. On the plus side the 4Runner comes with a roof rack for carrying extra stuff when you’re heading into the wilderness. Toyota offers six trim levels, starting at the base SR5 with 2-wheel drive, which lists at $35,170 including delivery. Moving to 4WD in the SR5 bumps the price to $37,045. Even the SR5 has the same engine and also a power driver’s seat, rearview camera and Bluetooth ability. 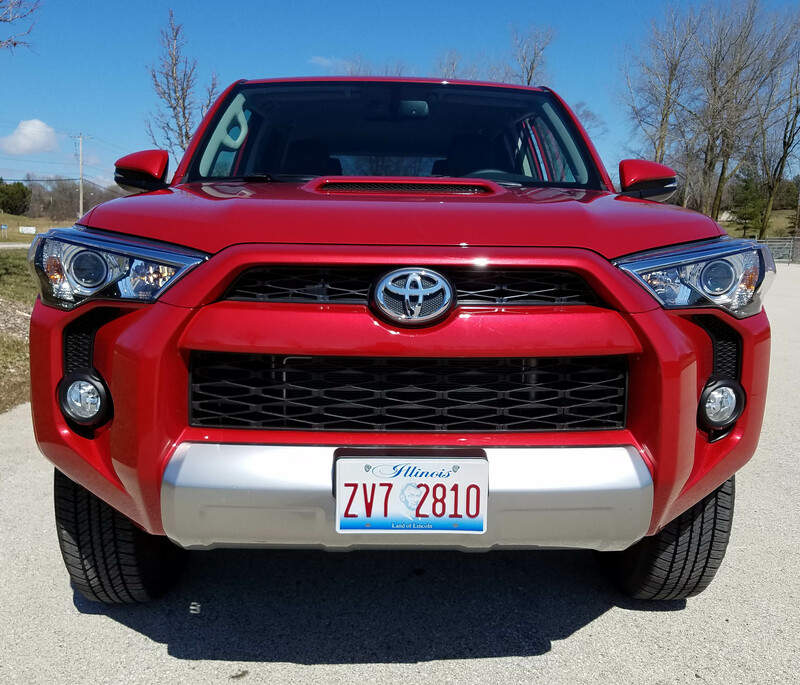 The tested TRD Off-Road Premium model lists at $39,395 with a $940 delivery fee. This model had a $750 discount and with just one option hit $39,835. 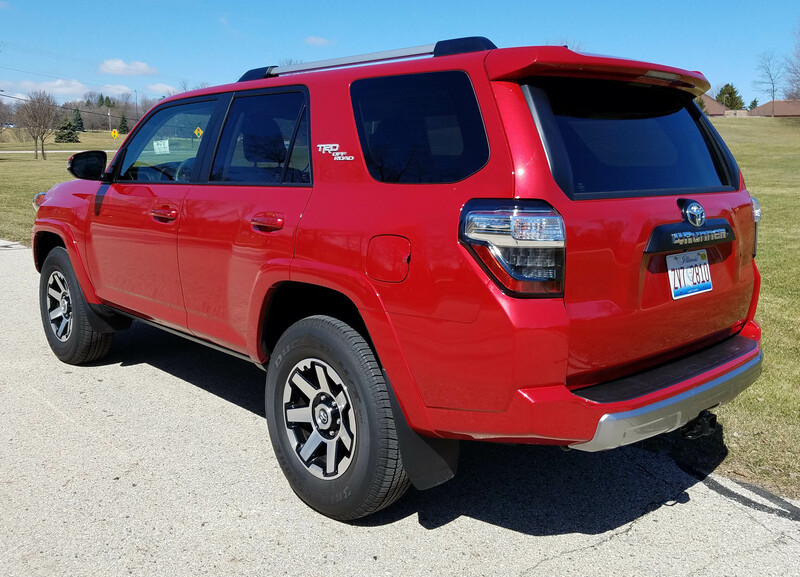 A Limited with 4WD starts at $45,320 with delivery and includes leather seats, a sunroof, JBL sound system, dual climate controls and fancier 20-inch alloy wheels. Consider a Nissan Pathfinder, GMC Arcadia and even a Jeep Wrangler as competitors, if you plan to go off-roading a lot. 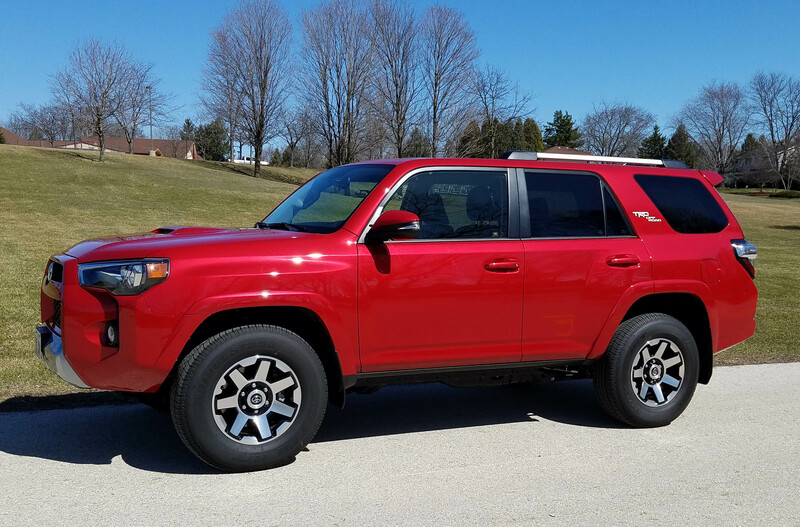 Certainly 4Runner is a strong contender in this segment and stands out from a styling standpoint. Hits: Tough looking truck with distinctive styling, roomy interior, serious off-road ability and good ground clearance. Decent ride for a truck, strong engine, big cargo storage, heated seats and big control knobs. Misses: Huge step-up height, low mpg, rainwater drips off roof directly onto seats when door opened, tiny nav/radio screen, no sunroof, key start.